MyDonate - whilst not so well known, this site gives the charity the best value, by taking only a credit-card processing fee and passing on the rest of the donation. Regrettably this site will close in June 2019, so any fundraising that will continue after this date will need to revert to one of the other options below, of which Virgin Money Giving gives Breast Friends the best return. You can use any of these to make a single donation, a monthly donation or to set up a fundraising page. You can find out more about online giving websites and how much they pass on to charities here. Alternatively, text ﻿﻿﻿BFSC20﻿﻿﻿ and the amount you would like to donate (minimum £1) to 70070﻿, and this will be processed through JustGiving. 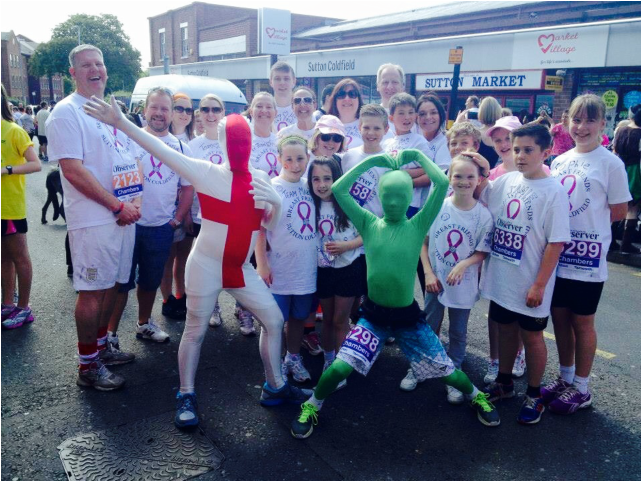 You can also support us by sponsoring someone taking part in the Great Midlands Fun Run as part of the Breastfriends team. If you are taking part in a sponsored event you can download a sponsor form ﻿here﻿. This is approved by HMRC for recording Gift Aid. If you need a Gift Aid form for one-off donations, you can download one here.